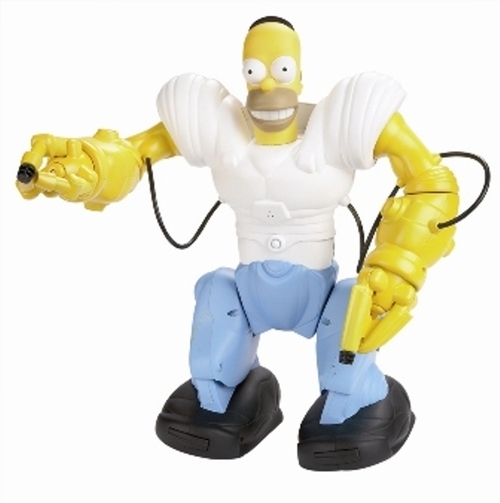 From what I found this is not a real product just some really great photoshopping. Which is really a shame because I would buy this in a second. I looked a little deeper and found that the truth behind this is so much better then the photoshopping. 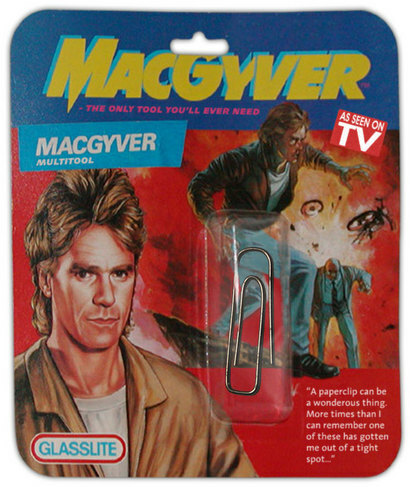 In the 1980’s a company called Glasslite sold Macgyver toys in Brazil. 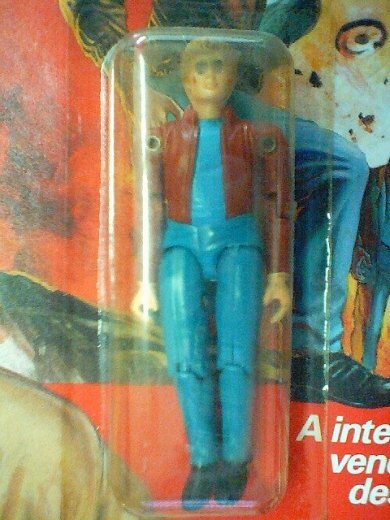 The base of the photoshopped product above is the Macgyver Action Figure (pictured below), part of an entire line released exclusively in Brazil including a jeep, motorcycle and helicopter. I am by nature a lazy person. I do try very hard to fight that and stay active but when I see something like this it makes me think about the possibilities. 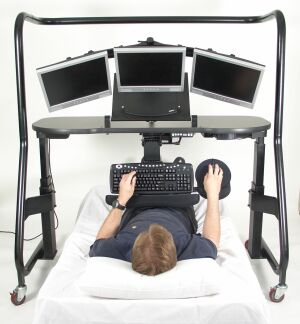 The rig above is an actual product called the Ergopod 500 and the only thing that would keep me from buying it and installing a bed in my cube at work is the price tag. 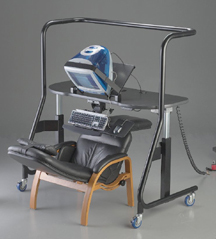 I understand this product is really meant for people with disabilities, but if they were only going for that market, why would they have included this pic? My Dad is really into genealogy, he has a pretty decent family tree put together of our family. He did it all the old fashioned way; starting with paper, pen, official records, and memories. While I admire the amount of work he put into it, I know that I could never spend so much time putting something like that together. That is the beauty of the Internet, it allows people to easily collect distributed knowledge in one place for the benefit of everyone. It is in that spirit I introduce you to Geni, a genealogy website setup like a social network. You define your own profile and tree, you invite family members to your tree and they can add in details about themselves as well as more people into the tree. It is secured so that only people in your tree can see information about you (or even that you are on the site at all) which is a benefit over just posting your family tree online for the world to see. You can find more info about it on the Geni Blog (I think it is cool to see a blog on a site that is starting out like this, if I ever make a commercially viable web product I would do this). 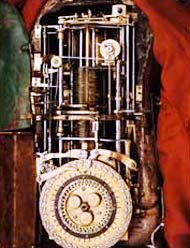 I came across this blog article about a mechanical robot built in 1772 by Pierre Jacquet-Droz, a Swiss Clockmaker. The “automata” in the article is called “The Writer”, it can be programmed to write any 40 character phrase. That’s right you can program this machine built in 1772, long before the first computer, to do something I can’t even do very well today. After doing a little Wikipedia research I found a couple of other automata built by Jacquet-Droz. 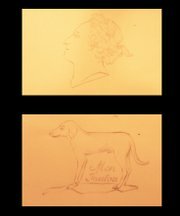 I am particularly impressed by “The Drawer” which can draw four different images (see the examples below). I can’t imagine how a person in the 1770’s would react to seeing something like this, keep in mind that the 1770’s is American Revolution and Marie Antoinette time frame so something like this would be fairly, well, revolutionary. It is amazing to me that with today’s complex technology, we can still be floored by what someone could do in 1770, I think that it shows that if you have an idea you will use any technology available to you to realize that vision. It makes me wonder what other inventions could be revisited with modern technology. It is true that it has “a certain creepiness” but it really doesn’t make me want popcorn and I will probably never look at poor Orville the same way again. However, I am posting the commercial on my blog (which means tens of people will watch it) so maybe the commercial is doing its job. I still say as a general rule, don’t let dead people sell your products on TV (keep them on the radio where they belong). I should start by saying that I never miss a Steve Jobs Keynote. I don’t just watch the announcement live on all the blogs that are lucky enough to be in attendance, I go back and watch the video of the event after I know what he is going to say. One thing Apple is great at is building hype and I love buying into it hook, line, and sinker. I also must say that I don’t own ANY Apple products. I am writing this post from my Dell laptop, I use my Dell Axim for GPS and work scheduling, and I have a Cingular 2125 Windows Smartphone that doubles as my mp3 player. I am not sure where that puts me in the Apple vs. Microsoft battle and honestly I don’t care. Yesterday marked another Steve Jobs keynote and another day of me watching the blogs and waiting for the video to get posted online. If you haven’t yet watched the video, I suggest you do. For one it shows off the products really well, but it also is a marketing dream, just watching the crowd reactions tells you alot about this company and its place in our culture. For those of you who are too busy to watch the video (it is long) or browse the website, I will try to summarize the iPhone as best I can. It is an Apple smartphone (although it is more fairly in my opinion a PDA phone), it has iPod functionality (basically it can sync with iTunes and play all the iPod media), and has WiFi/Edge connectivity for internet (and internet enabled programs). There are plenty of cool features to go along with this, like a MultiTouch touch screen, improved voicemail (treats voicemail like email), SMS (treats texting like Instant Messaging), and all the Apple eye-candy you can handle. So, as a Windows Mobile device user what are my impressions of what I have seen. I think there is real innovation here, the MultiTouch technology allows you a great amount of flexibility in an on-screen keyboard and other UI (like using the “pinch” motion to zoom in and zoom out). 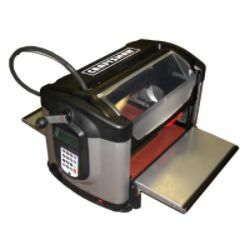 I have seen this technology used before for demonstrations, but this is the first application I have seen that really takes advantage of it. Another innovation here is that someone finally realized that voicemail doesn’t have to be an answering machine, it can be an inbox. The Cingular site says this is a first in the US, so I am guessing that other countries have already seen this. Jobs really hyped up the web browsing aspect of being able to load full html web pages as a great innovation. I have used 3rd party browsers on my PDA that work in much the same way and I have to say that for me the novelty wore off quickly. Maybe Apple is going to do it better (I know the multi session aspect of web browsing looked much better then anything I have seen before). There are some other things from the presentation that I found interesting. Jobs compared the iPhone to the current most popular smartphones (Blackjack, Q, Pearl, etc), all with keyboards, smaller screens, etc. I don’t deny these are the most popular smartphone devices, but there are a few devices out there that are much more similar to the iPhone (like the Cingular 8525), these devices are really PDA’s with the phone functionality added. I am not saying that the UI of the iPhone doesn’t appear better (at least it appears much more flashy), but the difference is not so staggering. How will the touch screen work? I have a PDA and I have programs that are meant to be used with your fingers, and while this interface works it can be frustrating. Jobs claims that Apple solved this, I want to see it for myself. How is dialing a phone number? I am concerned about this, in the keynote Jobs glazes over the fact that from the home screen you are two menu’s away from being able to dial your phone. (It appears this is both true for using the “keypad” to dial, or getting to your contacts). This is a problem that the Windows PDA phones have too and is one of the reasons I don’t own one. How much can this phone be customized? Ok, from the keynote I know you can set the background picture. How about setting a mp3 song as a ringtone? Can I (or any one for that matter) write a widget and load it on? These are both things that I can do on my smartphone that weren’t addressed in the keynote. Where are the bluetooth headphones? Come on, if you support A2DP (the bluetooth headphone profile) you should be shouting it from the rafters, the fact that you aren’t makes me think that you won’t support bluetooth headphones. So few devices in the US support this and you would have to think that an iPod phone (that has bluetooth support) would jump all over this. I was able to hack my phone with the profile and I have to say it is the coolest thing to just throw on headphone and push a button to listen to music (while the phone stays in my pocket). What about voice controls? This is a great way to get around the 2-menu deep dialing. If I am wearing my headphones can I push a button and tell the phone to call someone? Again this was not covered in the keynote. What is up with EDGE? This is something that I have already seen covered at length in other blogs. It is insane to think that Apple would partner with Cingular and use their last generation technology. Especially because this is being touted as an internet device that is intended to browse full html pages (not the quickest over EDGE). This one is tough because some of my other concerns could be fixed with a firmware/software upgrade later, this one means you would have to buy another phone later. Which brings me to my last question….$600 for 8gigs? Really? In the keynote Jobs defends the price of the 4gig model ($499) by saying that a 4gig Nano costs $199 and you will spend $299 on a smartphone. I will give him that (although, as he admits in the keynote, $199 is a better figure for a smartphone), but even doing that the math doesn’t work out for the 8gig. The 8gig Nano is $249, add the overpriced smartphone and you come up $50 cheaper then the 8gig iPhone. Using Jobs pricing argument we are almost to the price of a 30gig iPhone. (Hey a 30gig iPhone, that would be nice). Will people pay it? sure they will (I am sure Andy is already saving up). My conclusion is that there are way to many questions (go figure, it was just announced yesterday). As an iPod Nano with phone functionality it is awesome and a huge upgrade. As a smartphone with iPod functionality it raises the bar in some places and lowers it in others. My guess is that if all goes well, 2008-2009 will bring a new iPhone that handles many of the questions I have here and will be a much more tempting first Apple product for me. That being said, having Apple in this market can only be good, it will force the competition to copy all of their cool features and add more of their own on top. I should start by saying that like most American’s I love TV, probably to an unhealthy level. You can find something to watch at any moment of any day, and the best part is that until you start watching it you didn’t even know you wanted to. I do at times think about what my love of TV does to my life, I have had many nights where I get home from work sit down in front of the TV and then all of the sudden it is time to goto bed. Almost all of my best memories happened when the TV was off, and when I am unable to watch TV I am much more productive, creative, and happy. That being said, I want to reiterate that I love TV. My love of TV and wonder on what it does to me is what led me to this New York Times Article. The author of the article has not owned a TV since 1974, this is not to say that he has been living in the dark ages, he apparently uses a computer and enjoys other facets of modern life, just without TV. The article is written about him purchasing and experiencing TV for the first time in over 30 years and provides an interesting perspective on modern TV programming and culture.